Colorado inventory of all hogs and pigs on March 1, 2018 was 770,000 head, up 3 percent from December 1, 2017 and up 10 percent from last year. Breeding inventory, at 155,000 head, was up 5,000 head from the previous quarter but unchanged from last year. Market hog inventory, at 615,000 head, was up 3 percent from last quarter and up 13 percent from last year. The December 2017-February 2018 pig crop, at 698,000 head, was down 7 percent from the previous year. 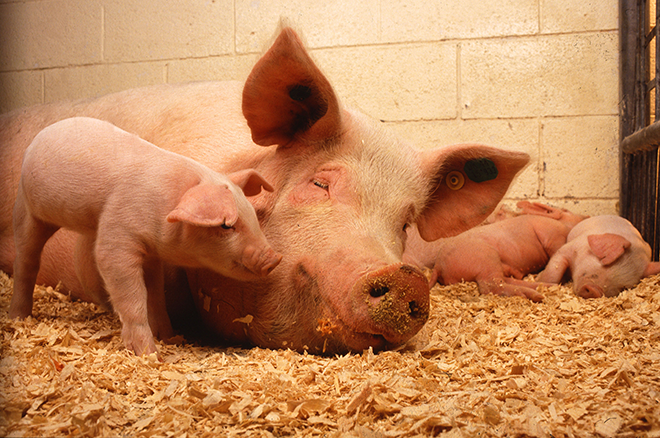 Sows farrowing during this period totaled 72,000 head, down 5 percent from a year ago. The average pigs saved per litter was 9.70 for the December-February period, compared with 9.90 last year. Utah inventory of all hogs and pigs on March 1, 2018 was 495,000 head, down 10 percent from December 1, 2017 and down 29 percent from last year. Breeding inventory, at 75,000 head, was down 5,000 head from the previous quarter and down 5,000 head from last year. Market hog inventory, at 420,000 head, was down 11 percent from last quarter and down 32 percent from last year. The December 2017-February 2018 pig crop, at 277,000 head, was down 18 percent from the previous year. Sows farrowing during this period totaled 36,000 head, down 8 percent from a year ago. The average pigs saved per litter was 7.70 for the December-February period, compared with 8.70 last year. United States inventory of all hogs and pigs on March 1, 2018 was 72.9 million head. This was up 3 percent from March 1, 2017, but down 1 percent from December 1, 2017. Breeding inventory, at 6.20 million head, was up 2 percent from last year, and up slightly from the previous quarter. Market hog inventory, at 66.7 million head, was up 3 percent from last year, but down 1 percent from last quarter. The December-February 2018 pig crop, at 32.3 million head, was up 4 percent from 2017. Sows farrowing during this period totaled 3.06 million head, up 2 percent from 2017. The sows farrowed during this quarter represented 49 percent of the breeding herd. The average pigs saved per litter was a record high of 10.58 for the December-February period, compared to 10.43 last year. United States hog producers intend to have 3.08 million sows farrow during the March-May 2018 quarter, up 2 percent from the actual farrowings during the same period in 2017, and up 4 percent from 2016. Intended farrowings for June-August 2018, at 3.16 million sows, are up 1 percent from 2017, and up 4 percent from 2016. The total number of hogs under contract owned by operations with over 5,000 head, but raised by contractees, accounted for 47 percent of the total United States hog inventory, down from 48 percent the previous year. All inventory and pig crop estimates for March 2017 through December 2017 were reviewed using final pig crop, off icial slaughter, death loss, and updated import and export data. The net revision made to the December 2017 all hogs and pigs inventory was 0.3 percent. The net revision made to the September 2017 all hogs and pigs inventory was less than 0.1 percent. A revision of 0.6 percent was made to the June-August 2017 pig crop.